I’m sitting now on the sofa. 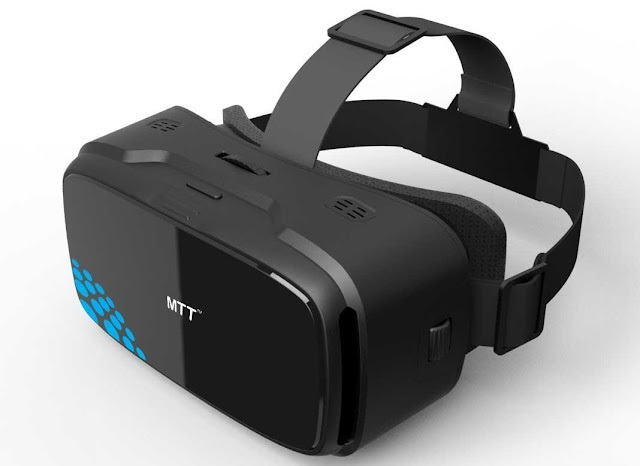 My VR headset is with me now. VR means virtual reality. I'm basically a tech savvy person. Technology attracts me a lot. 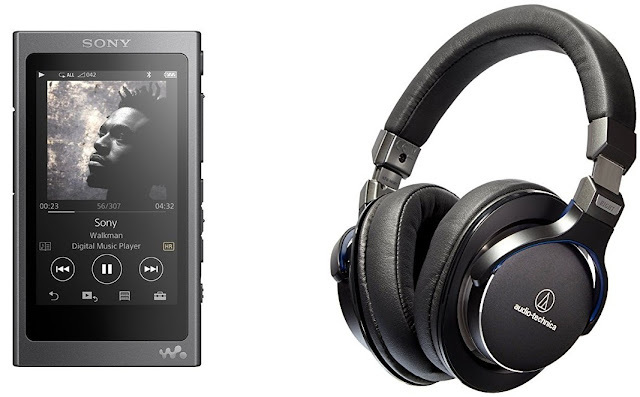 I wrote in my previous post that I want to buy a Sony Hi-Res Walkman with Hi-Res Audio Technical headphone. Just like hi-res music, VR is now very popular. Even I heard GTA VI might have an opportunity to play in VR. This most awaited game will release in 2020. Another authority source says- GTA VI may releases in 2018.Though Rockstar North official did not disclose much information about this game. They just said- we got some new ideas and working on it. GTA V is an awesome invention in the gaming world. So natural looking graphics, so original. I won’t say so realistic. Cause I play with cheats and mods. LOL. Right now I’m writing this from my MacBook. From the starting of this blog, I write every blog post draft on notes. Mainly I write in my mobile while laying on the bed. And when I edit them. I access that note from my PC. The process is simple. Go to iCloud.com. Open notes and copy it from there. You can do the same thing from MacBook if you connect your Mac to the internet and give access to iCloud to backup your notes. But somehow this is not happening in my MacBook. I tried for several times. I've seen some Youtube tutorials. But the problem is still there. Alternatively, you can send your notes to your email id, and you can access it from your PC. So now I’m doing that. While searching for latest gadgets, I found an article- Best Gifts For A Tech Lover. Here are some options like Smart Watch, Windshield Projector, iPhone Charger Stand, Bluetooth Speaker. I would love to add two more gadgets. Hi-Res Walkman and Drone Camera. Drone is very much popular nowadays. Even some tech bloggers don’t leave to take advantage of this. They created blogs on drone reviews dronesglobe.com. It is an excellent Amazon affiliate site idea, and they make $$$$$ from it. I have never seen a flying drone. Maybe I will buy one shortly. Drone photography is also famous now. Have you seen 'Gerua' song video? Many scenes of that song are captured by drone camera. In case if you miss it, here is the video for you. It's not the 'Gerua' official video. It's the making of 'Gerua' so that you can clearly see the drone. I know a photographer in our area, who uses drone camera, named Anup Maitra. He is one of the best photographers here. I saw once a stunning picture captured by him (or his drone). Unfortunately the picture is not found. If I find later, I'll surely update that. Another great option for tech savvy people. I forgot to mention that. It’s my recommendation. Hoverboard. I've seen hoverboard first in Thailand in a shopping mall. If you live in near Kolkata, you can see these in Eco Park. Eco park has been made with vast areas. So if you want to avoid walking the long distance, overboard can be a perfect option for you. You can find those on Amazon or Flipkart. Price will be around 20k for a standard quality hoverboard. The hoverboard is also a micro niche idea you can start. The benefit is that you can monetize these blogs with both Amazon Associates and Google Adsense. When the monetization topic came, I want to share about some youtube channels like Dance Freaks. 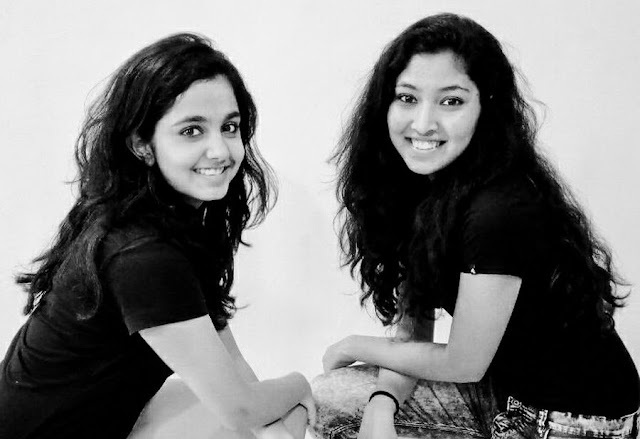 Titas Chatterjee is the channel owner with another girl- Anushka Gosavi, her dance partner. They are such talented dancers! Love them. I am pretty much sure they do not upload videos only for promoting their talents, but they can make $$$ from the channel. You can easily monetize a Youtube channel. But this case, they use famous Hindi/English songs behind their dance videos. Basically this is very normal. But here is an issue. As the songs are copyrighted materials, so it's not possible to monetize that type of channel with Google Adsense. If they still use Adsense ad. they will not receive any money. They money will be added to the youtube account which holds the copyright of that particular song. I will suggest them to use any cover version of that song and give him/her credit with a link in the description. You can alternatively try with a remix version (not from T-Series or such authority Youtube channels). I have a Youtube channel for fun. I uploaded a video of popular Indian band Underground Authority’s live song- "Hamma Hamma". As that was a live version, so there was no problem of copyright infringement. 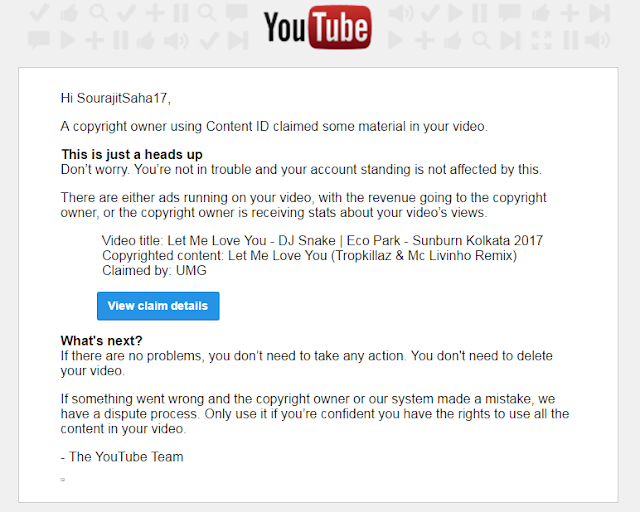 Whereas I uploaded another video- sunburn show in Kolkata- DJ Snake was the center of attraction of that program. Snake played a song “Let Me Love You”. The song has been made in collaboration with both Justin Bieber. Snake played the original version with the exact beat. For that reason, the video could not qualify for monetizing with AdSense. Youtube sent me an email regarding this issue. Here is the screenshot of the email. This is digital scanning process. They can not detect the live version. Popular song detecting app Shazam use the same technology. It’s an amazing invention of science, I must say. It helps me to find many good songs those are still unknown to me! Anyway. Bye for now. If you have any question related to this article, feel free to contact me. You can do drop a comment below. I will surely reply you. Thanks.